Beginning from Internet Explorer 7 (IE7), Internet Explorer (IE) has a new feature called Search Bar with Instant Search box, replacing the Search Assistant and Search Pane in Internet Explorer 6 (IE6). The unique feature of Instant Search box is that users can add as many search providers as they want to the Instant Search box, which can be selected later as the search engine to use to perform a search for whatever keywords typed in the Instant Search box. And the search can be done using different search providers simply by selecting another engine using the drop-down list on the Instant Search box. 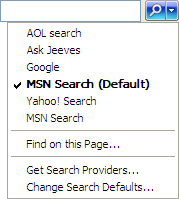 Microsoft provides plenty of ready-built search providers (no longer available) to add to the Instant Search box in IE. It’s also possible to make your own custom and specialized search providers (refer to KB918238). When your Internet Explorer has many custom made search providers, you probably want to do a backup of the search providers list. Ability to export the search providers list also useful when you want to copy or migrate the search providers list to another computer or for sharing. It’s also wise to backup the search providers list especially those with a big list just in case hard disk corrupts and you have to reformat Windows. Restore from backup will save a great deal of time. Run Registry Editor by typing regedit in Start Search (for Windows 10 / 8.1 / 8 / 7 / Vista), or Run command (for most Windows including Windows XP). Make sure SearchScopes branch is selected by clicking on SearchScopes. 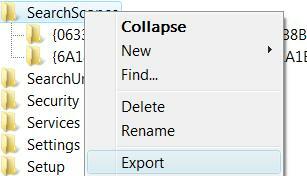 From the “File” menu, click Export, give a filename and save the file as a .REG file. You can also right click on “SearchScopes” and select “Export” on contextual menu. A file named SearchProviders.reg (you can name yourself, but make sure the file extension is .reg to indicate that it’s a registry file) will be created at current directory. Once search providers list is exported and saved, simply double click on the .reg file to merge the merge the contents to the registry, and re-create all search providers list. If you want to copy the list to another computer, simply transfer over the .reg file and install it. The trick works on most version of IE, including IE7, IE8, IE9, IE10, IE11 or later.